Happy Thursday everyone! Welcome to another Creating Kindness around the world blog hop! You are currently visiting Carolynn Sander, in Calgary, Alberta, Canada. If you have been following the hop you would have just arrived here via the talented Lou Kitzelman! I love what she had to share with us today! The theme for today's hop is embossing! Embossing is one of those awe inspiring techniques! & There are so many ways to emboss now a days! I hope you enjoy today's project! As well, remember to click on the next button at the end of this post so that you can follow the entire hop! For today's project I decided to try a new embossing technique (new to me anyways), & so I pulled out my In Colour 2018-2020 Stampin' Emboss Powder Set. 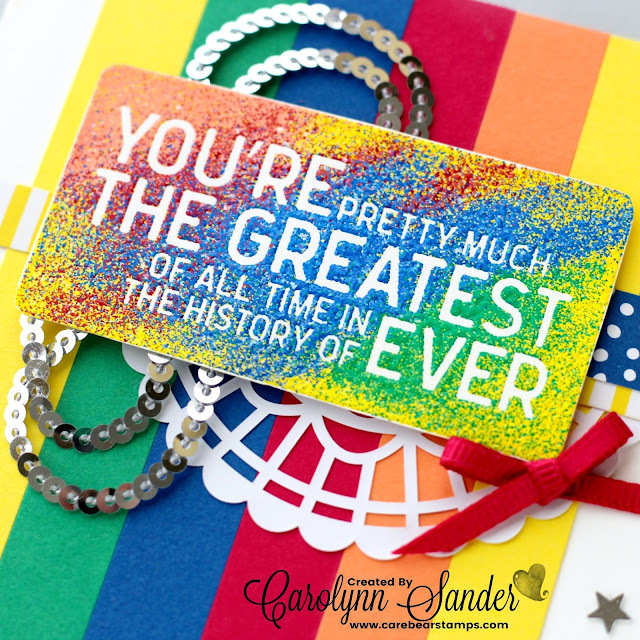 I trialled my first attempt at multi-coloured embossing, and this is what came of it! What do you think? Pretty cool huh? My hubby's first comment was, "Is that a gay pride card?" I thought well not really, but why not? Our city just hosted it's annual gay pride parade last month. I love rainbows. I love my friends regardless of their sexual preferences. So why not? Love is love.💖 Too bad I didn't post this beauty last month when the timing was right. But truth is, we should always be cognizant of these topics. & We should love one another regardless of our differences on all fronts. For today's project, I reached for my Stampin' Up! Calls For A Celebration Stamp Set. Check out the wonderful sentiments that are part of this set below. What do you think? Isn't this set fabulous? As far as the multi-coloured embossing goes, first choose a stamp of your liking. I find solid or bold stamps work best. Then ink your stamp up with Versamark Ink and stamp on Whisper White Cardstock. Next, sprinkle the different shades of embossing powder on one at a time. Make sure you shake off the excess powder in between colours. If you are careful you won't contaminate your powders with the other colours. 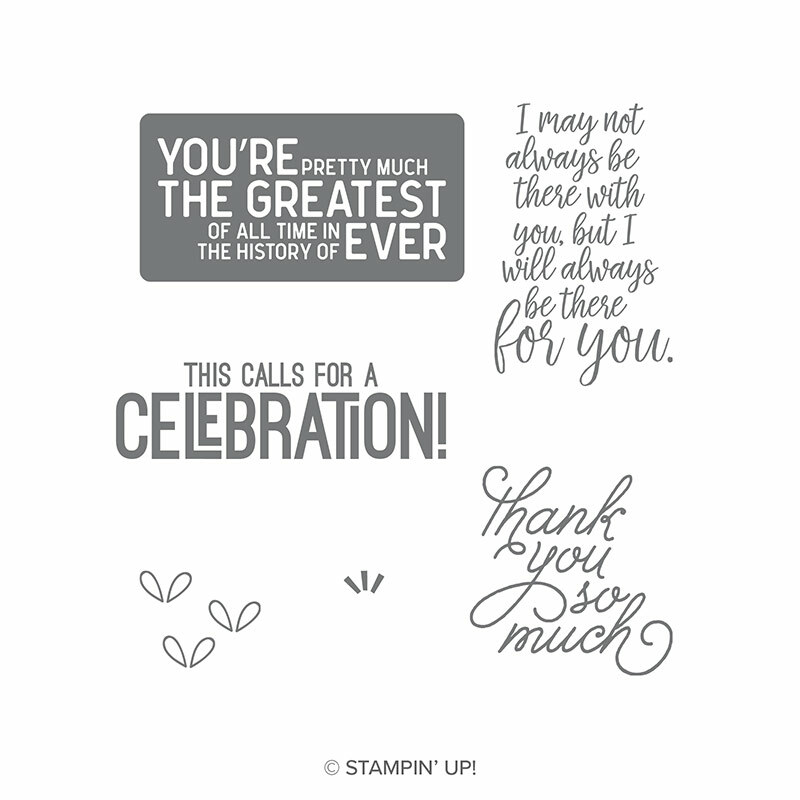 Lastly, heat set your image with your Stampin' Up! heat tool. It is seriously easy oh peasy! Well I hope you enjoyed today's project! Next up in the hop is Marcy Denning! She has a stunning project to share with us today!💖 Click on the next button below so that you don't miss out! Thank you so very much for visiting today! I am always so thrilled to have you! If you have any questions in regards to today's project feel free to message me, or leave a comment below! As well, if you are from Canada and you are interested in purchasing products from my Stampin' Up! online store just click on the "Shop" icon below! For a test card, you've gotten it perfect! When I see rainbows, I always think of you, so it's no surprise to see a rainbow today- just for any occasion <3.